Like any educational endeavor, hands-on science requires lots of trial and error, and good ideas may not always strike a chord with young imaginations. So how do you know when you’re on to something really good? The Discovery Outreach team has an answer: Bring in the real experts — elementary school students — to serve as your alpha test team, and allow them to help develop and provide instant feedback on new projects. The Boys and Girls Club of Dane County has been doing just that every Monday afternoon for the past 18 months. 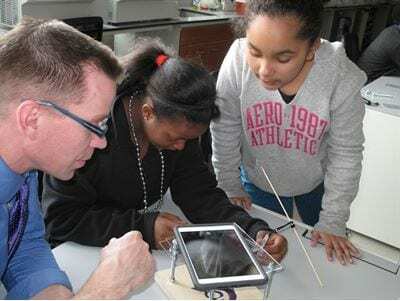 Groups of anywhere from 10 to 20 students, from grades three through eight, join outreach staff in the Wisconsin Institutes for Discovery Teaching Labs to cook up fun ways to experience science. The Sparks of Discovery program is funded by the Madison Community Foundation and the National Science Foundation, with curriculum development support from the Madison Children’s Museum. The goal is to produce about a dozen new hands-on science modules, some of which can be replicated in virtually any educational environment. All of them come with the kid-tested seal of approval. On a recent Monday in March, after a snack of banana nut bread and organic milk from Slow Food UW, 10 fifth-graders from the Taft Street Boys and Girls Club settled in to learn how to harness light to serve a purpose. They poked holes in plastic two-liter bottles, covered the holes with blue tape and filled the bottles with water. Over a plastic tub, they pulled off the tape and shined a flashlight through the bottle, watching the ray of light follow the stream out of the bottle. They are learning about the importance of light as part of a project to build their own microscopes. Students built a platform with two clear plastic shelves mounted to a wooden base. The top plastic shelf has a small lens installed and the bottom is used to hold specimens. The students line up the lens of their tablet computers to the mounted lens, creating a compound effect that produces remarkably sharp magnification. “Come over here and look at these crystals!” shouts student Kaila Brown, having focused her microscope perfectly over a chunk of borax crystal. Other students checked out aquatic leaves and butterfly wings. Later in spring, they will take their microscopes out into nature at the UW-Madison Arboretum. “Making things and building things is the best part,” Brown adds. Most everything the group does is cobbled together in the teaching lab, from the subject matter to the exploration tools. The goal is to make the projects as portable as possible so they can be recreated in schools, libraries, clubs or at home. They use affordable materials and opt for open-source software whenever possible. The first successful module to be applied is on microfluidics, where students design their own “tiny tunnels” using “shrinky-dink” plastic sheets. The project shows how microfluidics can be used in research and medicine, as well as the process of chemotaxis, or how cells migrate toward desirable chemicals. Another project involved rapid prototyping, using the 3D printers from the Advanced Fabrication Laboratory. As it turned out, the prototyping project had a higher barrier-to-entry than expected, since there was a significant amount of technology set-up time involved. A.J. Kriha, senior director of programs for Boys and Girls Club of Dane County, says club members have many options for after-school programs, and the Discovery programs have been consistently popular. Their students are strongly drawn to hands-on science experiences of all kinds. The program has meshed well with the Boys and Girls Club desired outcomes, which include “commitment, trying new things, education and creative thinking,” Kriha says. Sparks of Discovery is one of dozens of programs conducted for visitors of all ages by Discovery Outreach, a joint collaboration between the Wisconsin Alumni Research Foundation and the Morgridge Institute for Research. More than 100,000 people from across the state, nation and world visit the Discovery Town Center and teaching labs each year to experience the wonders of scientific inquiry. For more information, contact Director of Programming Laura Heisler at 608-316-4392, laura@warf.org; or visit discovery.wisc.edu/town-center.